What follows is a massive disservice as I take a policy wonk approach to outing the problems in our current English policy. 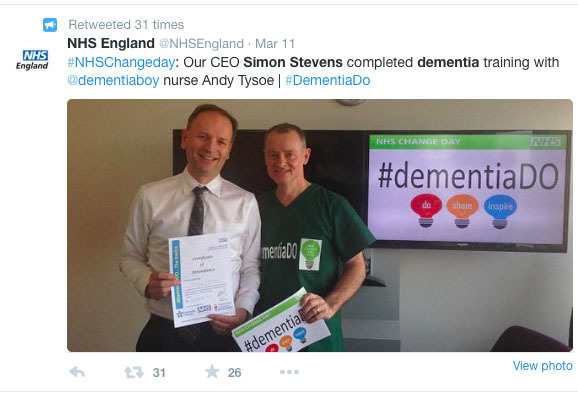 You would better served in spending your time listening to Andy Tysoe or Tommy Whitelaw, whose efforts on dementia are truly remarkable. It is truly a sad indictment of our society that the impetus behind the G8 dementia and global initiatives in dementia may have been more to do with public-private handouts to boost an ailing industry, rather than a sincere wish to people currently living with dementia to live better. The “Prime Minister’s Challenge on Dementia“, from the Department of Health, Cabinet Office, and the Prime Minister’s Office, was probably more disappointing for what it didn’t say rather than what it did say. The central issue for many is what the point of diagnosing a dementia is, “if nothing can be done about it“. This might explain, in part, the policy stance that prevention of dementia, ‘healthy body healthy mind’, is a worthy cause. And indeed the policy initiative from the Blackfriars Consensus is helpful. In terms of opportunities for ‘wealth creation’, it offers opportunity for open innovations, such as ‘wearable technology‘, to come light and to become marketed. The present NHS sometimes appears to be more fixated about how much of its work can be exported abroad to make a profit than the effects of cuts on patient safety. That social care spending is now on its knees, consequent upon it not being ringfenced, is however a threat to patient safety; and the added legal problem with residential homes in private care is that information about staffing can be withheld from freedom of information requests due to being ‘financial sensitive’. Similarly, recent initiatives on whistleblowing, such as the Francis Review, have concentrated on toxic cultures in the NHS rather than residential homes. The NHS and care sectors are still likely to have patient safety problems, given the trend in the size of the NHS litigation budget. There is an argument for zero hour contracts in the care sector offering ‘flexibility’, but such arguments must be proportionate. For many, however, zero hour contracts offer poor job security. Many caregivers are below the national minimum wage. Carers do not have rights under the present NHS constitution. Currently, the system is kept afloat through the valiant work of a huge army of unpaid family caregivers, who often worry themselves about the lack of support they are given in doing their job. There needs to be a much more coherent framework of the regulation of paid carers, many feel, however, for the minority of caregivers who seem inadequately trained in dementia including risk assessment. As a person living with dementia needs care needs, there is no doubt that the needs of carers need to be given a priority in a new English dementia strategy. Carers clearly do need support, not least because caring is psychologically, emotionally, financially, and physically draining. A person with dementia at some stage will be involved in a decision as to whether to stay at home, or to move into a nursing home or care home, for example. Unmet medical needs such as incontinence, falls or declining mobility often underlie why some people with dementia go into residential care. The reason many feel that post-diagnostic care and support is inadequate is because it is perceived that the organisation of it is haphazard, with stakeholders not communicating with one another. The silos cannot go on, and it’s not on that there seems to be no-one in overall control of dementia policy, or even directly accountable for it. The lack of communication between residential care in the community and acute hospital trusts helps to explain the logjam of some people with dementia experiencing delayed discharges. It is all very well to talk about ‘parity of esteem‘, but such calls sound hollow with slashes in funding in social and mental health care. And health is so much more than health and social care – it’s all to do with how we are able to lead our lives, including education, housing and transport, for example – and that applies to people with dementia and caregivers too. Many people with dementia, and friends and families, feel that they have maximal involvement with the medical profession at the beginning and end of their experiences with dementia, with the annual check up serving little function other than to repeat investigations to emphasise what a person with dementia cannot do any longer. This is completely wrong, if you wish to reframe the argument from what a ‘dementia patient costs’ to what ‘value a person with dementia brings’. Add on top of this that the National Health Service is fragmented and geared up to be a ‘repair’ service rather than ‘care’ service. Sure, repair is important, but often repair can be avoided altogether if there is better proactive case management. It is utterly deplorable that, even when the contributions of Marie Curie and Macmillan specialist nurses are undisputed, that there has been scant attention to the clinical outcomes and financial benefits of a national network of clinical nursing specialists (as described recently in the HSJ). The “Admiral Nurses” scheme would have massive benefit if England were to invest appropriately here. I am extremely grateful to campaigners such as Beth Britton for keeping the flame of reasonableness alive. There is no doubt that the Alzheimer’s Society have assumed a market dominance, and this is of course good for the sustainability of this sector, but they must be able to campaign effectively on shortcomings of government policy, whichever government that is, to act as a good corporate citizen with license to operate and license to lead. Such a dominance in providers is not in the best interest of persons using the NHS, especially if the voluntary sector is to participate in clinical contracts (e.g. cancer care), so a preferred model of care to offer the post-diagnostic support infrastructure for dementia is likely to be alliance contracting as successfully implemented in other jurisdictions (e.g. New Zealand). English health policy is heading towards collaboration rather than competition, so it is important that service provision in dementia also takes the lead; legislation in England needs to give voluntary sector providers some long term security, such that they can develop the capacity to expand to help the NHS form resilient communities. A person-centred approach would mitigate against lack of continuity of care. Persons living well with dementia have a multiplicity needs, requiring the ‘whole person’ approach, not least reflected in numerous comorbidities. Part of the problem we have had in English dementia policy is the overprescription of antipsychotics (see the Banerjee report 2009), but if we invested in a workforce trained in personhood (using techniques such as life story) and addressed problems in communication, particularly in residential care settings, we could mitigate against such a high need need for antipsychotics inappropriately prescribed for alleged agitation and aggression. I feel it is crucial now we take the NHS on a radical transformation from a patient-oriented service to a person-oriented one. Broadening the explanatory perspective on illness to include social and psychological factors has expanded the remit of medicine into the realm of ‘healthy’ bodies. Again, this has been particularly evident in general practice. The promotion of wellbeing must surely be seen as integral to that. Wellbeing in general measures ‘individuals’ subjective perceptions that life as a whole is good’, thus there is a strong link to the fulfilment of needs. A biopsychosocial perspective alone is not enough for a full understanding of the patient’s experience of illness, which depends on his or her particular life story; for example rheumatoid arthritis in the fingers might have a more profound effect on a concert pianist than a long jump expert. Even if a person is diagnosed with exactly the same condition or disability as someone else, what that means for those two people can be very different. A care and support plan should truly reflect the full range of individuals’ needs and goals, bringing together the knowledge and expertise of both the professional and the person, and it should give parity of esteem to mental and physical health needs. But the ‘no decision about me’ has tended towards vacuous sloganeering – but it is quite telling that the World Dementia Council were so slow to appoint someone living well with dementia, and even then appointed someone who was not democratically elected. While I think the actual appointee is brilliant, it is hard to see how one voice can ‘represent’ the views of millions of people living with dementia worldwide without proper resource allocation. Part of the reason that many people in the general public believe that ‘nothing can be done about dementia’ is the relentless framing of dementia in the media as ‘dementia sufferers’ or ‘X has lost his battle against dementia’, and news of the latest game-changing “breakthrough”. The raison d”être of ‘Dementia Friends‘ was to combat stigma and prejudice through educating the general public about give basic facts about the dementias, but there has never been any systematic peer-reviewed publication on these basic campaigning facts were chosen, or how effective the organisers of ‘Dementia Friends’ have been in seeing their pledges materialise ‘turning community to action’. I think it is laudable to reframe the discussion of public services, and I do sympathise with the view of David Willetts in ‘Civic Conservativism’ predating Cameron’s antidote to the Big State as the “Big Society” (see for example his noteworthy Hugo Young lecture). But I do draw short shrift at ‘death by information session’, dressed up haphazardly as “training”, in other words making the State impoverished and malnourished of resources. In my view the workforce does need to be properly training in dementia from those who have been adequately trained (I admire Andy Tysoe as he is properly trained.) For every pound spent on developing a cure for dementia that’s one pound deprived from frontline care. I am very much enthused about the need for visionary basic research in dementia. I myself made a groundbreaking discovery in the diagnosis of the behavioural frontal variant of frontotemporal dementia, which is currently in the Oxford Textbook of Medicine. But we have an English dementia strategy which has benefited from corporate capture, regulatory capture and Big Charity capture. For every pound spent on the NHS on a medication for dementia which does not slow progression and only has a limited time window for the treatment of symptoms (according to NICE), that’s one pound being deprived for a ‘social prescription‘ which could actually improve the quality of life of someone living with dementia (such as an iPod). Social prescribing offers a prompt means of providing an alternative to medication, which is a way to avoid physical disease and mental illness even. Here we do need above high quality research into living well with dementia which offers comparatively, in my view, the best return on investment; see the brilliant research, for example, from the “Dementia” journal. But please don’t get me wrong! I would be absolutely delighted if the medical profession were able to come up with a safe medication for Alzheimer’s disease which could cross the blood brain barrier (and a comparable treatment for the other 100 or so dementias). There’s absolutely no doubt in my mind that communities can be “dementia supportive”, a term I prefer possibly to “dementia friendly”. The point here is that communities should be supportive as a matter of legal obligations, i.e. should not be unlawful in not providing reasonable adjustments under the Equality Act (as dementia is a disability), or living in a care home which do not meet basic human rights in dignity. Otherwise, it merely becomes a race to the bottom of shopkeepers wishing to establish their ‘dementia friendly’ credentials to make a fast buck. I am especially attracted to the idea that communities, if supportive of people living with dementia and caregivers, can mitigate against loneliness and isolation which can so easily follow the clinical diagnosis of dementia. Rights are indeed important in the NHS: it may, in certain circumstances, be more effective to exert ‘choice’ through the NHS Constitution in future for a right over where to die than through a personal budget. And the actual diagnosis itself merits scrutiny. We should not be in a race to the bottom there, with high volume low quality diagnoses. For every wrong diagnosis, there is a victim of that diagnosis. Clinicians are regulated for this, but Big Charity is not. There has never been any systematic study into the harm done by an incorrect diagnosis, though presumably that would have been addressed in the impact assessment of the QOF ‘incentivising dementia diagnosis’ policy. I think primary care is overstretched, and I have a huge amount of personal admiration for GPs (my late father used to be a GP for about 30 years). But it would be unfair to overload them with making the diagnosis, even though the ‘diagnosis gap’ is well rehearsed elsewhere. It is truly sad for me, as someone who has given a large part of my life to this, much of it in a voluntary capacity, that visions for dementia in England are more to do with individual egos and commercial aspirations of Big Charity than the actual needs of people living with dementia and caregivers. I do, however, look forward to hearing from people I respect, such as Agnes Houston or Kate Swaffer (who is about to go to Geneva to speak at the WHO/ADI conference on behalf of the Dementia Alliance International). But otherwise… we really cannot go on like this.